With the popularity of technology, people become aware of energy. They started to feel its importance. Now we have looked for an effective technique to store energy. Major thing that we used to store energy in cars is battery technology. But there is no competition between gasoline energy and battery energy. For example a typical car's energy carries 1,000 pounds (454 ki) of lead acid batteries these batteries take many hours to recharge and give only 100miles which is equal to 160 km range. Two, three gallons of gasoline give the same range weight less than 30 pounds which is equal to 13 kg and you can fill that amount of gasoline in about a minute. Here I mention some alternative energy storage methods wanna try any one of them. One of the oldest techniques people keep using, is the falling weight . They lift the weight up high to store energy in it and let the weight fall to get energy back. Many cuckoos and grandfather clocks use this technique. The whole system design with proper gears. But this approach we can't use in electric cars but worked very well in clocks for thousands of years. This technique also be used by using water they pump water when energy is in excess uphill and when they want energy they take from it. This method is known as hydroenergy. Another way to store energy is in the same form of repeatable mechanical deformation. thats the technique behind a spring used in a wind up clock or a rubber band used in a wind up airplane. In this technique we can store energy in a spring by deforming it and energy stored in the form of elastic energy. When our energy back it brought to its original shape. This technological problem in springs installed in cars that is for sale. Nature also storing energy for us for a long time . Everything made for some purpose. Nothing is useless. Plant stores energy that came from sunlight in the form carbohydrates. 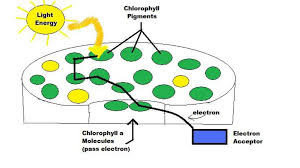 chrolophyll converts sunlight into energy. Another technique that nature used to store energy is fat.We are familiar with it in a personal way. It is interesting to amagine a car that somehow eats grass or some other carbohydrates and stores it as fat. Fly-wheel is a very interesting method to save energy by spinning it stores energy and run turbine when we want it.